Hardware: 3 Strap Hinges, 3 Sets of handles. A great way to improve the curb appeal of your home on a budget, is a new garage door. Skip the paint(and choosing the right color), or fancy new landscaping. A new garage door can do a lot to up the curb appeal of your home easily. Take it from Tom’s neighbors, a new garage door is magic! 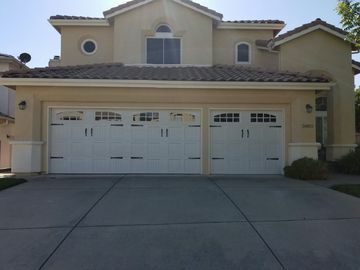 Tom, a Rocklin resident, called us in need of a new garage door. Not only was he looking to up the wow factor on his garage door, his noisy opener was annoying and not working for him anymore. After browsing some catalogs, he landed on the “Chateau” garage door. Chateau is a steel door with a carriage stamp, windows, and decorative hardware. The model resembles the carriage door look, but instead of using wood, it is made from steel. Steel is more affordable than wood, but imparts the same expensive and tasteful look. Regarding his noisy opener, Tom decided on the new Wi-Fi battery backup belt opener by Lift Master. In Addition, Tom decided to go with a new Wi-Fi battery backup belt opener by Lift Master. The coolest feature of this opener is the ability to control the opener from your phone. In case of a power outage, for instance, Tom is able to open his garage door since the opener comes with a battery backup! We always know when we got it right, when we see the look on our clients face when they see their new garage doors installed for the first time. 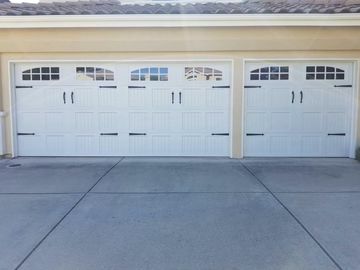 Tom admitted that even though he knew updating his garage doors was a good investment and would make a difference, he didn’t think it would have as much impact as it ultimately did. Tom is very happy with his beautiful new doors and quiet, smooth new opener, and we are too! He even said he caught a neighbor rolling by his house extra slowly to check out his new garage doors. Mission accomplished!